Ebony has a home! 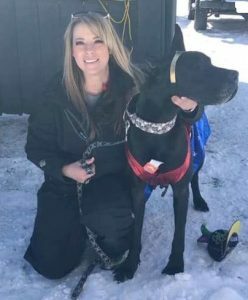 - Rocky Mountain Great Dane Rescue, Inc.
Ebony has a home with her foster Mom in Georgetown, CO! When Ebony came into Rescue, she was full of parasites and was a very nervous girl. She needed a special foster home where she could have her space, as well as someone willing to take her to her many vet visits and help her heal. With Katie having a background as a vet tech, she was the perfect person to foster Ebony. The two have since bonded, and Katie couldn’t see her life without Ebony. Katie lives in the beautiful Rocky Mountains where she and Ebony can hike and explore whenever they want. Ebony shares her home with Joey, a 5 year old Terrier Mutt. She also guards over her chicken siblings, and loves to snuggle in bed with Katie! We are so happy for Ebony and her new family! Way to go sweet girl!